Right now, copay accumulator programs are one of the hottest and most controversial topics being discussed in our industry. This tactic represents a change in prescription drug benefit plan designs offered by pharmacy benefit managers (PBMs) to plan sponsors. Using names such as “out-of-pocket protection” and “coupon adjustment: benefit plan protection,” these programs are designed to shift specialty drug costs to patients and pharmaceutical manufacturer assistance programs, thereby saving plan sponsors money. TrialCard has designed a solution that mitigates the negative impact of this new benefit design. In traditional plan designs, copay assistance programs offset costs otherwise paid by the patient, such as deductibles, copayments, or co-insurance. These forms of patient cost-share accumulate to an out-of-pocket maximum, at which point, the health plan pays for the entire cost of the drug for the remainder of the plan year. Prescription drug benefit plans employing a copay accumulator take advantage of copay assistance programs offered by manufacturers, denying a patient credit for any cost-sharing expense that is funded by the manufacturer’s program. The value provided by the manufacturer’s program does not count toward the patient’s deductible or out-of-pocket maximum, allowing the health plan to repeatedly impose the same cost-sharing expense on the patient. The end result is that the benefit offered by the manufacturer’s program is quickly exhausted. Patients are unwittingly left with a large out-of-pocket expense, leaving them at risk of non-adherence, or discontinuation of therapy. Even with generous manufacturer copay assistance programs that offer up to $25,000 in benefits per year, TrialCard’s data show that patients impacted by copay accumulator programs may exhaust the program benefit in as few as three prescription fills. These patients will be at high risk of non-adherence. They may also face financial hardship due to the high out-of-pocket cost on their third or fourth fill. As reported by the Kaiser Family Foundation in their 2017 Employer Health Benefits Survey, 57% of employees are in a plan with an individual annual out-of-pocket maximum of more than $3,000. The Affordable Care Act allows non-grandfathered health plans to have an out-of-pocket maximum of as high as $7,350 in 2018. With the median household income in the U.S. at approximately $58,000, most patients and families will have a difficult time paying $3,000 or more per prescription and may stop taking the medication altogether. In the long run, copay accumulator programs serving as a “cost-saving” tool for plan sponsors may actually drive up healthcare costs as patient adherence suffers due to out-of-pocket costs (page 27). Making matters worse, the specialty medications targeted by copay accumulator programs include medications for complex, chronic conditions such as cancer, HIV, multiple sclerosis, and hemophilia, to name a few. These therapies likely do not have generic drug alternatives. As such, copay accumulator programs discriminate against a population of patients who are most in need of assistance. The negative impact of copay accumulator programs on patients is TrialCard’s primary concern. However, pharmaceutical manufacturers will also suffer. Pharmaceutical manufacturers will see inflated program reimbursement budgets and lost revenues as patients prematurely stop therapy due to out-of-pocket costs. With these circumstances in mind, TrialCard proactively examined the data and consulted with our pharmaceutical manufacturer partners on this issue. 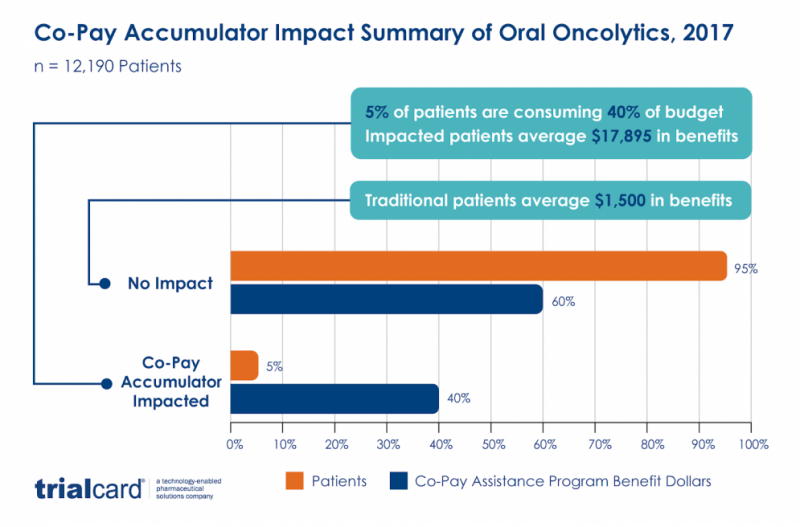 Using proprietary analytic techniques, TrialCard examined 2017 copay assistance program data across several oral oncolytic products (see chart below). 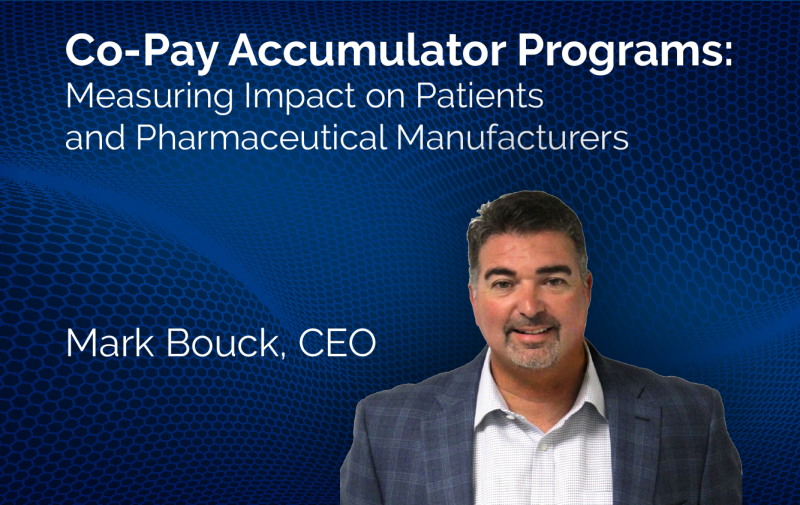 Our analysis revealed that, while just 5% of the patients enrolled in assistance programs appeared to be impacted by a copay accumulator program, those patients accounted for 40% of the total benefit provided by the manufacturer. As a result, average program benefits amounted to nearly $18,000 per patient. In contrast, non-impacted patients only utilized an average of $1,500 in program benefits. TrialCard’s analysis of specialty drug brands in other therapeutic areas revealed similar results. Using data from the first quarter of 2018, TrialCard estimates that the percentage of patients impacted by copay accumulator programs will double to 10% or more this year. Paying attention to this trend, TrialCard has moved quickly to design solutions to help protect patients from the negative impacts of copay accumulator programs. Our solutions use proprietary algorithms to proactively identify patients affected by copay accumulator programs before they exhaust the manufacturer’s copay assistance program benefits. Once a patient has been identified, TrialCard then provides assistance in a manner that allows the patient to receive the benefits of the manufacturer’s copay assistance program while getting credit towards their health plan’s deductible and out-of-pocket maximum. For a no-obligation impact assessment for your brand, email TrialCard’s Mark Droke (mark.droke@trialcard.com), SVP, Patient Affordability and Virtual Engagement.